If you thought Dinosaur Swamp was scary before, you ain’t seen nothin’ yet. 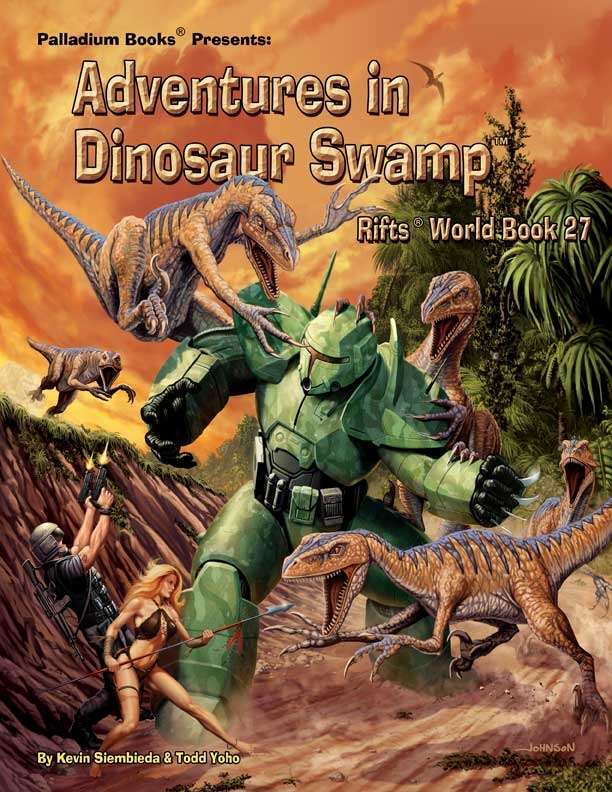 This World Book presents a host of new and strange dinosaurs and other dimensional misfits, ghosts, Indians, and dinosaurs that use magic and a few who even speak. Plus startling revelations about Deearn Neenok, details on his second expedition to Dinosaur Swamp, new dangers, dimensional anomalies and an emphasis on adventure. 20+ new dinosaurs and monsters, nearly 30 in all. Deearn Neenok and the A’rac spider people. The Second Neenok Expedition, the Lazlo, and adventures. 101 Adventure ideas, plus more than a dozen Hook, Line and Sinker™ style adventures, and more about the City of Char. Native Americans and the secrets of the Ocmulgee Mounds. New high-tech and Eco-Wizard weapons, equipment and gear. 160 pages written by Kevin Siembieda & Todd Yoho.